Adkins is locally owned and operated. Our team is made up of 25 staff members in the Klamath Falls and Medford offices including seven licensed Professional Engineers and two licensed Professional Land Surveyors. 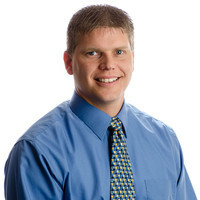 Jon is a licensed Professional Engineer and Certified Water Rights Examiner in Oregon. He graduated from Oregon Institute of Technology with a B.S. in Civil Engineering in 1998 and shortly after joined Adkins as a Junior Engineer. 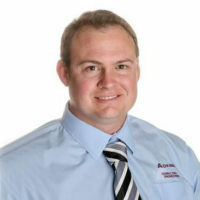 In 2012 Jon became a partner in the firm serving as the General Manager and is a versatile member of the Adkins team. His responsibilities include project management and development, civil engineering, quality control, design, and mentoring young engineers in the firm. In his time off, he enjoys cycling, camping with his family, attending his kids’ sporting events, visiting extended family in central and northern Oregon, and volunteering in the community. He is an active member of his church, and is a Klamath Falls Gospel Mission board member. 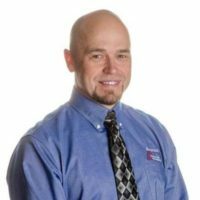 Michael is a licensed Professional Engineer in Oregon and California and a lifelong resident of Klamath Falls. After graduating from Mazama High School, he proudly served as an M1-A1 tank crew member in the United States Army. Once he returned home, he obtained his B.S. in Civil Engineering from Oregon Institute of Technology, graduating in 2002 with honors. After graduation Michael worked for Precision Structural Engineering as Engineering Manager, until joining the Adkins team in 2009 and became a partner in 2012. Michael specializes in structural engineering, project management, construction engineering and quality control. He currently serves as the firm’s Treasurer and Human Resources/Office manager. He enjoys his relationships with staff and, in particular, developing young professionals. Michael recently served two terms as Treasurer for Southern Oregon branch of the American Society of Civil Engineers, and enjoys spending his off-work hours with family and friends. He loves all things outdoors including biking, camping, fly-fishing, hiking, hunting, photography and snowboarding but has a special passion for mountain biking. Dan is a licensed Professional Civil Engineer and Certified Water Rights Examiner in Oregon. After obtaining a B.S. in BioResources and Agricultural Engineering with an emphasis in Irrigation from California Polytechnic State University at San Luis Obispo, he returned to Oregon to work for the Jackson County Soil and Water Conservation District in Medford, Oregon and later for the Natural Resources Conservation Service (NRCS) in Klamath Falls, Oregon. At Adkins, Dan is responsible for project development, design, and management within the water, wastewater and natural resource industries including irrigation, water rights, wetland restoration, stream restoration, municipal water and wastewater facilities. In 2015, Dan was appointed to the Klamath County Natural Resources Advisory Council by the Klamath County Commissioners. He recently became a partner and serves as the firm’s Secretary. Outside of work Dan enjoys spending time with his family and just about any outdoor activity. Over the past several years, Adkins has assisted the City with the funding, planning, design engineering, and construction engineering for our recently completed Wastewater Treatment Plant upgrades. The project is the largest project we have completed in the history of the City and totaled $6 Million in total project funding. For Lake County, Adkins Engineering has helped us deliver projects on time, under budget, and with the highest quality in mind for our customers. Adkins Consulting Engineering has been working for the City of Klamath Falls for over 30 years. To date they have competed over 150 engineering, surveying, and material testing contracts for the City. The projects have ranged from small to large and complex and include roadway, wastewater, and water projects. Adkins not only provides a high-quality product for our irrigation and stream restoration projects, but they are also easy to talk with and take the time to explain project design details in a way that works for project managers, contractors, and landowners. All in all, working with Adkins has been a great experience, and we look forward to working with them on many future projects. Their actions on the Henley School Project helped reduce costs for the bus and vehicle parking areas on the magnitude of $150,000. This was greater than their entire work order amount so they essentially paid for themselves during the design phase of the project. This is a sign that Adkins is truly looking out for the needs of each project and client.